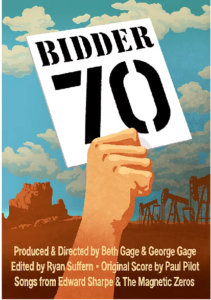 Multiple award-winning film “Bidder 70” will be shown by the Melrose Unitarian Universalist Church Green Sanctuary Committee on Saturday, April 22, at 7:00 pm in the Parlor. Please join in and see this important film on Earth Day. “Bidder 70” centers on an extraordinary, ingenious and effective act of civil disobedience demanding government and industry accountability. In 2008, University of Utah economics student Tim DeChristopher committed an act which would redefine patriotism in our time, igniting a spirit of civil disobedience in the name of climate justice. On December 19, 2008 Tim DeChristopher disrupted a highly disputed Utah BLM Oil and Gas lease auction, effectively safeguarding thousands of acres of pristine Utah land that were slated for oil and gas leases. Not content to merely protest outside, Tim entered the auction hall and registered as bidder #70. He outbid industry giants on land parcels (which, starting at $2 an acre, were adjacent to national treasures like Canyonlands National Park), winning 22,000 acres of land worth $1.7 million before the auction was halted. Mr. DeChristopher was then indicted on felony charges.